[PDF] An Invitation to Operator Theory (Graduate Studies in Mathematics, V. 50) | Free eBooks Download - EBOOKEE! Description: This book offers a comprehensive and reader-friendly exposition of the theory of linear operators on Banach spaces and Banach lattices. Abramovich and Aliprantis give a unique presentation that includes many new developments in operator theory and also draws together results that are spread over the vast literature. For instance, invariant subspaces of positive operators and the Daugavet equation are presented in monograph form for the first time. The authors keep the discussion self-contained and use exercises to achieve this goal. The book contains over 600 exercises to help students master the material developed in the text. The exercises are of varying degrees of difficulty and play an important and useful role in the exposition. They help to free the proofs of the main results of some technical details but provide students with accurate and complete accounts of how such details ought to be worked out.The exercises also contain a considerable amount of additional material that includes many well-known results whose proofs are not readily available elsewhere. 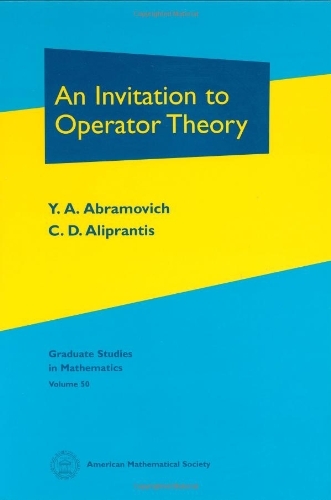 The companion volume, ""Problems in Operator Theory"", also by Abramovich and Aliprantis, is available from the AMS as Volume 51 in the ""Graduate Studies in Mathematics"" series, and it contains complete solutions to all exercises in ""An Invitation to Operator Theory"". The solutions demonstrate explicitly technical details in the proofs of many results in operator theory, providing the reader with rigorous and complete accounts of such details. Finally, the book offers a considerable amount of additional material and further developments.By adding extra material to many exercises, the authors have managed to keep the presentation as self-contained as possible. The best way of learning mathematics is by doing mathematics, and the book ""Problems in Operator Theory"" will help achieve this goal. Prerequisites to each book are the standard introductory graduate courses in real analysis, general topology, measure theory, and functional analysis. ""An Invitation to Operator Theory"" is suitable for graduate or advanced courses in operator theory, real analysis, integration theory, measure theory, function theory, and functional analysis. ""Problems in Operator Theory"" is a very useful supplementary text in the above areas. Both books will be of great interest to researchers and students in mathematics, as well as in physics, economics, finance, engineering, and other related areas, and will make an indispensable reference tool. No comments for "[PDF] An Invitation to Operator Theory (Graduate Studies in Mathematics, V. 50)".